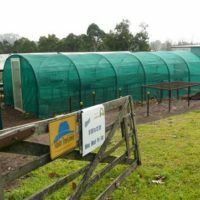 Dandarrga Landcare (NSW) run a not-for-profit, volunteer-managed nursery that raises native and rainforest species for planting projects. The funding was used to buy computer equipment, produce signs, and run community workshops. The aim was to increase the group’s capacity to education and train the community in protection and enhancement of local biodiversity. Under this project they ran seed savings and identification workshops and produced species lists and signs. The Tarrangower Cactus Control Group won the Landcare Community Group Award in Victoria in 2017. 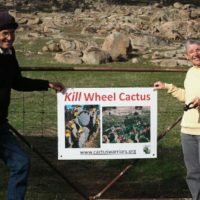 These cactus warriors have an army of volunteers who have destroyed millions of wheel cactus in central Victoria, particularly in Maldon outside of Castlemaine. 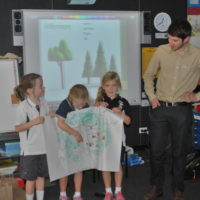 We gave them a grant to hire a project officer to extend the group’s work – develop new educational materials, reach out to landholders about taking action on this horrendous weed which is spreading across the landscape, produce a map, and encourage government to create a state-wide taskforce to tackle it on a larger scale. The Australian Wildlife Conservancy offers ecology and conservation internships. The internships are for biology graduates to work in the field on one of the AWC’s sanctuaries. Our funding ensured two graduates were placed on sanctuaries and had the opportunity to work with talented researchers and scientists to broaden their skills and experience. AWC continues to run this program and would be interested to hear from any donors who would like to fund an intern. The Foundation has a Leadership Development Grant Program and our first grant recipient was Anthony Gallacher from the Loddon Plains Landcare Network. Anthony was the coordinater of the GOANNA landscape restoration project in north central Victoria. The $5,000 grant assisted Anthony with professional development – courses, workshops, travel and equipment. This gives Anthony skills to do his job well, but also helps him develop into a leader in the field of landscape restoration. 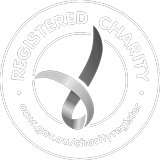 All donations are tax deductible and go directly to projects supporting the wellbeing of the Australian natural living environment.